14th Annual Spring Fling Drum Thing! Sally Childs-Helton put down the flute and picked up drum sticks at the age of 14, after being told earlier that “girls don’t play drums.” In her mid-teens she received a drum set from parents who believed that girls could indeed play drums. She also went to Hawaii, where she discovered musics unlike any she had ever heard. She was infatuated. While her peers played rock in high school, Sally played jazz and classical music. She majored in music education and percussion performance as an undergrad, and then spent way too much time in graduate school at Indiana University studying ethnomusicology, not because it was a good job move, but for the sheer love of it. Sally is a percussionist, ethnomusicologist, music educator, and mentor with 40+ years of teaching experience. She continues to study with master teachers, players, and facilitators, including David Darling, Glen Velez, and Arthur Hull. She is a co-founder of the Midwest Drumming and Dance Festival, a certified Music for People improvisation teacher, and a Remo HealthRHYTHMS facilitator. 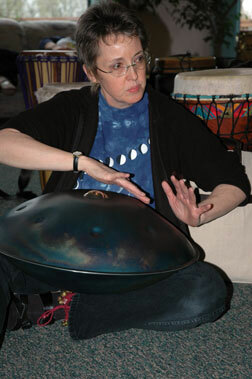 Sally also facilitates a sister event, the Ladies’ Spring Fling Drum Thing weekend at Oakwood Retreat Center. Sally’s areas of expertise include hand drums and ethnic percussion, music improvisation, classical percussion, and performance anxiety management. Dr. Childs-Helton teaches world music and ethno-musicology at the university level; conducts drumming and improvisation workshops around the country, in Canada, and Britain; and accompanies dance and movement therapy, Susurrus Modern Dance Company, and various theater productions and choruses. Sally and her husband perform around the U.S., Britain, and Canada as a duo, and with Wild Mercy, an eclectic Celtic band. She also plays with Thin Air improvising ensemble. A self-professed sound junkie, Sally believes almost anything can (and probably should) be a percussion instrument. She especially enjoys working with beginners of all ages, “re-beginners” who are returning to playing music, persons with visible and invisible disabilities, and with all people who are willing to discover their ability to create original, powerful, meaningful music. Sally creates a safe, supportive, and playful environment for musical, creative, and personal growth. Pamela Blevins Hinkle, former Artistic Director of the Indianapolis Women’s Chorus, is an improvisational musician, a facilitator of creative and spiritual retreats and a choral conductor. She has led the Indianapolis chorus since 1997, has served two Unitarian Universalist congregations as music director, and was choral director at Franklin College in Indiana. She received a Creative Renewal Arts Fellowship from the Arts Council of Indianapolis, which she used to explore chant and ritual song from diverse traditions. She is a student in the musicianship and leadership certification program of Music For People, which teaches free improvisation to people of all skill levels. Pam is director of the Spirit and Place Festival, an innovative event that integrates the arts, humanities and religion. She lives in Indianapolis with her husband Eric and their two daughters. Dona Robinson CPA, RYT—Prior to becoming a Registered Yoga Teacher, Dona was a Certified Public Accountant. Her approach to teaching yoga is to encourage students to increase awareness of their unique body and to discover their own body wisdom. Dona began learning about the body as a dancer and dance teacher. She began studying and practicing yoga in the mid 1970’s. She has completed cardiac and cancer yoga certification with Nischala Joy Devi, who developed the cardiac yoga program for the Dean Ornish studies. Dona is a 500 hour certified Viniyoga teacher and is registered with Yoga Alliance a national organization. She studied with Gary Kraftsow, author of “Yoga for Wellness” and “Yoga for Transformation” and is now studying for her yoga therapy certification. Viniyoga is a therapeutic yoga practice that works for EVERY body. The focus of Viniyoga is to find poses that suit the body, instead of forcing the body into the pose. Dona combines this unique blend of knowledge, experience and intuition to design classes that develop mind, body and spirit. Beyond yoga, Dona has been drumming for several years, sings with the Indianapolis Women’s Chorus, and and sings, dances, and drums with the liturgical dance group SpiritUs. Breath is an integral part of Viniyoga. The length of the breath while moving in and out of the pose can affect the experience of the body. Learning to be present with the breath brings focus to the practice and is calming to the mind. Many students report a sense of serenity and peace after the practice. Keeping the mind focused on the breath can reduce stress. Viniyoga adapts the breath to fit your specific needs. In addition to Viniyoga, Dona has studied with many excellent teachers and most extensively with the following internationally recognized teachers: Donna Farhi—Breathing is the foundation of her instruction. Her books include “Yoga Mind, Body and Spirit” and “The Breathing Book”; Gurucharan Singh Khalsa—Kundalini Yoga utilizes breath and movement that are repeated from one to three minutes. His book is “Breath Walk”; Judith Lasater, Ph.D. P.T.—emphasizes anatomical principles of spine, pelvis and hips. Her book “Relax and Renew” focuses on restorative yoga; Erich Schiffmann– keeps energy lines open and establishes open, injury-free poses. His book “Moving into Stillness” explores the energy lines of the body. Allison Ballard is the Director of Fort Wayne Taiko, a group she founded in 2000. Sponsored by the Fort Wayne Dance Collective and comprised of local drummers, Fort Wayne Taiko provides Northeast Indiana with taiko classes, workshops, lecture-demonstrations and performances. Ms. Ballard attended the 1998 Taiko Conference held in Los Angeles and the Taiko Camps held in California in 1999 and 2006. She co-created “A Village Beyond,” a 45-minute multi-media performance that uses taiko drumming, t’ai chi movement and haiku poetry to celebrate Asian culture. Performed by Ms. Ballard and three other dancing drummers, the piece is sponsored by Young Audiences and is toured at schools throughout Northeast/Central Indiana. 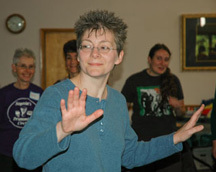 Allison is trained as a HealthRhythms™ drum circle facilitator and is a licensed Music Together® teacher. She received a Master of Arts in Dance/Movement Therapy from Columbia College Chicago in January 2003 and has studied modern dance technique, creative movement, improvisation and Authentic Movement with various teachers and artists. She has 15 years experience teaching creative movement and drumming/rhythm to children, youth, adults and people with special needs. Cynthia DeMar is a master teacher of West African dance. Drumming and dance is a family affair, and she and her husband and now adult children have taught and performed for years in their dance troupe Xangwe. Cynthia continues to study with West African master dancers at every opportunity. In her other life, Cynthia is a social worker and has administrated arts programs at the university level. Drummers, if you’ve never danced, Cynthia will get you started. Advanced dancers, she’ll take you to your next level. Experience the joy she radiates as she teaches and performs! Nina Ryan is a modern dancer and teacher with a gift for getting people to move and experience rhythm in their bodies, and has been teaching at drumming events for 10 years. Needless to say, Nina also drums. She performs with Susurrus Modern Dance Company and actively mentors younger dancers. Nina also works and performs with special needs communities. Come explore deep body rhythm and whole-body entrainment with her. Nina will get the rhythm rooted in your body! Debbie Gates, a pianist and singer since childhood, was seduced to the drumming side of the force about 7 years ago and quickly learned that drums are like potato chips—you can’t just have one. A woman with many interests, Debbie did a lot of theater as an undergraduate, is a photographer, and runs sound for several Indianapolis-area bands. In her excess free time, she performs with the eclectic Celtic band Wild Mercy as keyboardist, singer, and occasional percussionist, and she is also a percussion accompanist with the Indianapolis Women’s Chorus. Because of bandmates who are bad influences, she is also returning to playing guitar and has discovered that guitars also tend to multiply quickly. To support her music habit, Debbie is gainfully employed as the Mac diva at a large Midwest publishing house, and is house servant to three dogs (one named Drummer) and a boatload of cats. Beginning players are safe with her! Jamie Price was bitten by the drum bug three years ago, infected her husband, and now they build and sell amazing West African drums. Jamie especially enjoys West African drumming, and studies with master drummers from Guinea and the Ivory Coast. Her dedication to the style is apparent in her rapid growth from novice to skilled player over the course of several years. She also loves chant and singing. Jamie home-schools her two children, and is a novice bee-keeper. She will assist with beginning drum classes and chant. Stephanie Robertson is a nationally-known fabric artist who explores the sonic side of her creativity through singing and drumming. She sings with the Indianapolis Women’s Chorus, and she also sings to her fabric as she works with it (and it seems to make a difference!). Stephanie recently was invited to a glass studio in Germany where they worked with her to translate some of her fabric pieces into glass art and the results are fascinating. She is a recipient of a Creative Renewal Arts Fellowship from the Arts Council of Indianapolis, and is stepping down as president of the Stutz Artists Cooperative. We’re fortunate to have her facilitating our fabric arts workshops! Not all of the above faculty are at each event.